In the 40-7 rout of Carolina Sunday night, the Seahawks produced a rare offensive game, highlighted by the individual efforts of WR Tyler Lockett and RB Thomas Rawls. Had there not been a blown assignment on the play immediately following FS Earl Thomas’ tortured departure with a broken tibia Sunday night, a goof that resulted in a 55-yard TD bomb from QB Cam Newton to WR Ted Ginn Jr., the Seahawks would have had their first shutout since a 26-0 dousing of the Chicago Bears in the third week of the 2015 season. As it was, Seattle’s 33-point win over Carolina (40-7) marked its largest margin of victory since the 35-point rampage (43-8) over Denver in Super Bowl XLVIII. Sunday’s offensive turnaround from the previous week, a 14-5 loss at Tampa Bay, couldn’t have been more emphatic. At Tampa, the Seahawks netted 245 yards, 118 passing, and failed to score a touchdown for the third time this season. The Monday following, the Seahawks grimaced as they watched the .500 Buccaneers humiliate their offense, holding Russell Wilson to a 38.8 passer rating. Spurred by that drubbing, the Seahawks rolled up 534 yards and put up a season-high 40 points against the Panthers to go 8-3-1 with four games to play. Seattle’s only other streak of at least five winning seasons in a row: 2003-07. “The great thing is we answered (the laid egg at Tampa Bay) and came back,” said coach Pete Carroll. “We got the offense rolling, and had a big first half, 300 yards. The running game was alive and rolling and Thomas (Rawls) was on. Lockett and Rawls both contributed to the extraordinary yards-per-carry average, Rawls with his 45-yard TD run in the second quarter, Lockett with his 75-yard burst in the third. Lockett’s scoring run was the longest in CenturyLink Field history, eclipsing by three yards the 72-yard TD by C.J. Prosise against Philadelphia Nov. 20. This is the first time in franchise history the Seahawks have produced two scoring runs of 70 yards or longer in the same season. “I don’t know that I’ve seen a guy look faster than when he finished that run tonight,” said Carroll. Rawls produced his first 100-yard rushing game since a 19-carry, 101-yard performance at Minnesota Dec. 6, 2015. He finished with 106 and two touchdowns. But 103 of that, plus both touchdowns, occurred in the first half. 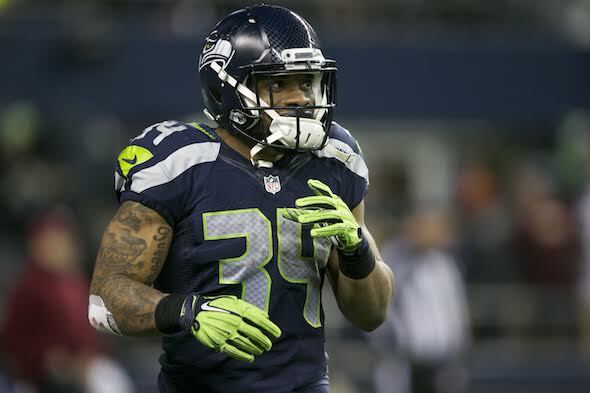 Rawls, who passed a concussion protocol at halftime, had four carries in the second half, but the Seahawks gouged out 240 rushing yards overall (sixth-highest total of the Carroll era) against a Carolina team that had held opponents to 79 per game. Seattle’s rushing number might have been reduced had All-Pro LB Luke Kuechly not missed the game with a concussion, but who knows? If Rawls hadn’t gotten banged on the head, he might have gone for 150 yards. Broussard collected 120 of his 138 rushing yards and both TDs — on runs of 77 and 43 yards — in the second half against Tennessee. Rawls is the only player to make the list on the basis of a first half (103 yards, 2 TDs, 11 carries).